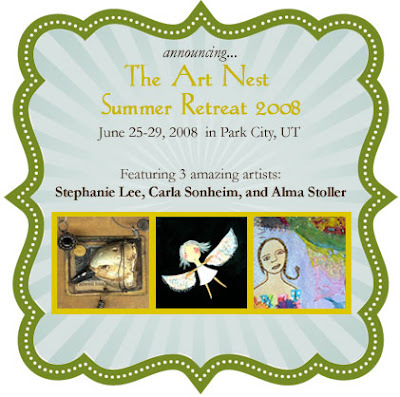 What a wonderful time I had at art nest this past week. It seems i have had an art nest hangover (is that possible?) this entire week; missing each of my dear new friends, trying to put my life at home back together, and making sense of yet another creative high. Do you know how much laundry can pile up from six people in four days? Well, you don't want to know, it is enough to keep me busy for days, and my fridge at home smelled really bad.......even worse than our funky cuisine at the nest. I leave you with a few pictures of our candlelight dinner on Friday night after we had been making vintage jewelry all day in Amy's class. Look at these ladies glow in their new jewelry made by them. I was amazed at the talent of each of our little nesters........ they were amazing. 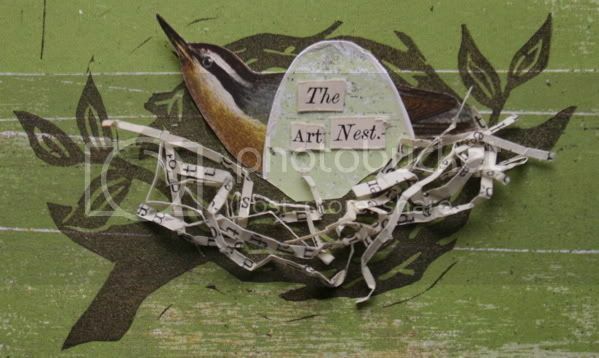 here is the adorable invitation Marina made for the nest. 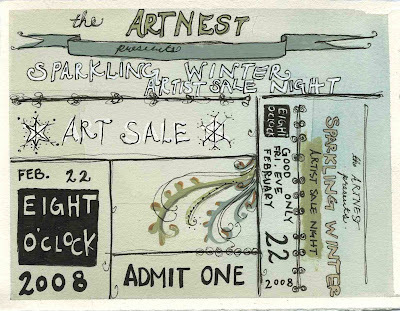 next week at the Art Nest we will be having the sparkling winter artist sale night Friday, February 22nd at 8:00 pm. We have invited everyone including the teachers attending to bring and sell their artful gatherings and art work. We are having a chocolate tasting table amidst the twinkling lights outside, warm drinks and lovely little things to adore. local artists and friends are invited to the artist sale, we would love to have you join us! please email us at theartnest@hotmail.com for more information. Anahata Katkin's post. . .see you soon ladies! As for our day together I wanted to ease your minds about the hunt for a “focal image”. 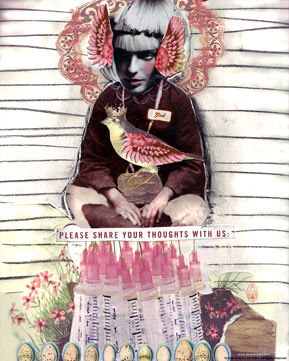 I asked each of you to bring favorite faces and copies of imagery you like. I find that some of the easiest things to do is to find great and striking faces and make COPIES of them in black and white on standard paper. This instantly takes the glossiness out of an image and makes it really easy to integrate. I think integration is the key to collage. So don’t work too hard hunting down the world’s greatest faces. Just go for something that’s got a great expression or some kind of beauty you connect with. The fun part is making ordinary people into fantasy, layered creatures. I use lots of boring faces and then I work hard to make them come to life. Look through 5 magazines and then tear out pages and take them to get photocopied. Change the sizes. Blow them up, etc. (Make extras of your favorites to share!) The emphasis should be primarily on the face. You don’t need a perfect human form. 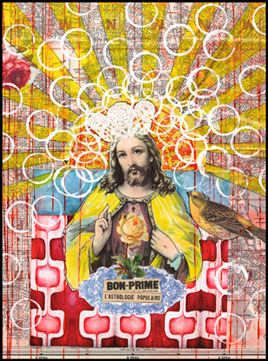 In fact I hardly ever use an image in it’s whole form. I will work with everyone to integrate these faces so there isn’t any “floating heads syndrome”. Just copy, copy, copy. Bring a file full of stuff to pick from and it will make it really fun. Don’t worry about having perfect stuff. Just think about strong faces, and a few options. Working with what we have is half the thrill. You may also choose to bring photographs. But I suggest that if they are modern that you also copy them. The glossier the photo the harder it is to integrate into original artwork. 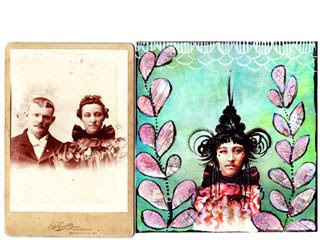 Old cabinet cards and sepia photos always work great. You may color copy these if you want to keep some of that great range of tone. You can also use the original if you don’t mind wrecking it. A few patterns here and there and extra bits are always nice. But again. Just go with your gut. You really can’t go wrong here. And again. PLEASE do not try and pre-plan your projects. Just see something you like and throw it in a file. We will do all the rest together! See you soon ladies! I can’t wait! Ok, a few reminders: You'll need a ledger. Any hard cover book will do actually, I just happen to love the repurposing of these old ledgers. We are going to be pulling out all the pages and sewing the new paper in, so don't worry about the insides. You don't need to worry about your binding too much either. I try to save the binding on the ledgers, but if it is too thin (in width) or too frail, I just glue on binding linen. I will bring the binding linen in case anyone needs any. It can be quite expensive, so you might not want to buy a roll until you decide if you'll be making more books in the future. If you are still on the hunt for a ledger, try ebay. Search under ledger, accounting book, or journal. They can get quite pricey, and be sure you check the size as well. I have bought many a journal that comes and is half the size (and once even twice the size) of what I was expecting. 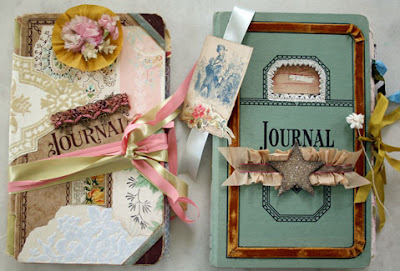 I will be shipping about 5 journals to sell once there ($25.00 ea.) in case anyone is in a real bind, but this isn't ideal, as you'll want to tear or cut your paper to size before coming. Speaking of paper, I really can't recommend enough that you use this paper enough, it is so fun to play on: Fabriano Artistico 140lb. HOT press (smooth vs. Cold press which is more porous). You can buy sheets of it from dickblick.com or danielsmith.com . If you choose to use another paper, be sure that you can fold it in half without it cracking. We will be punching holes in the creases to sew into the binding and need the paper to withstand it. While at home, cut or tear your paper into 18 sheets. You want the size to be roughly 1/4" -1" less than the size of your book on all four sides when your book is opened flat. You'll need a tapestry (size 18) needle, waxed linen thread (unwaxed will tear the paper),an awl, material to cover your binding if we have to tape on a new one, scissors, adhesives (I LOVE "Perfect Paper Adhesive by USArtquest"" you can find that online at the above sources or even at Michael's. You'll also want a small jar of gel medium for your new binding, and maybe some glue dots, glue stick etc. You will want a heavy holding glue (like E600 or Gorilla Glue) if you are planning on gluing on some heavy embellishments to your cover. Of course, the standards: scissors, glues, an exacto knife,a scrap of sand paper, an awl if you already have one, a japanese screw punch if you already have one, paintbrushes- with different size brushes, fine to 1"-not foam, nice brushes for watercolors or acrylics. 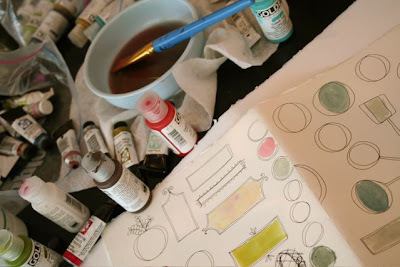 You'll also want a small mixing tray so we can play with glaze and also mix some colors. 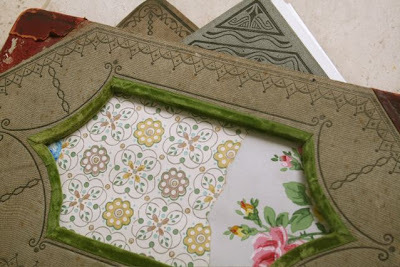 To add your personal touch, bring embellishments for your cover, ribbons, stamps, markers,pens,stamps, ink pads, colored pencils,clip art,ephemera,photographs,collage materials. 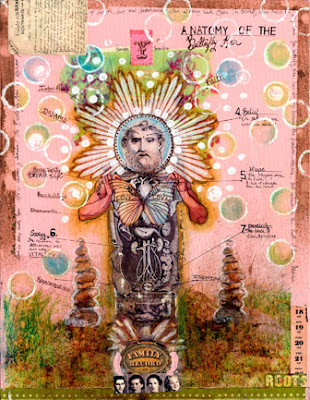 When ordering your paper, I recommend that you buy a couple tubes of water colors- Daniel Smith, Windsor & Newton, or Grumbacher are brands I have used. And also a few Golden Liquid Acrylics are great. You can also buy these at the online art stores OR I have seen both watercolor tubes and Golden Liquid Acrylics at Michael's Arts and Crafts stores. 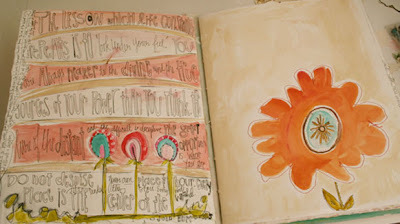 Your playful spirit, and anything else you like to play with when journaling! Amy Hanna, two weeks to go. . .
two weeks from today we will be gathered in the cabin having dinner together. the snow is so beautiful, you won't even believe it. 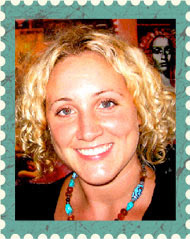 . .
we asked Amy Hanna if she would write a post for those us still working on gathering our supplies for her class. 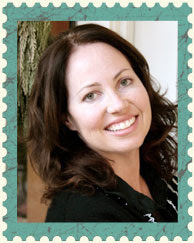 thank you Amy, your work is so breathtaking! I would suggest each person bring an ounce of 24 gauge wire in half hard. I bought an ounce last week and it cost around $23.00. One ounce of 24 gauge wire equals 48 feet. This is good for most beads. It is always good to have some 26 gauge wire also in half hard. Some gem stones and pearls have very small holes in them and only 26 gauge will fit through them. I would also suggest to bring some 22 gauge wire in dead soft. One ounce of 22 gauge wire equals 31 feet. 22 gauge is great to connect found pieces and to make hooks for closures. Wire also comes in 21 and 20 gauge I would suggest using dead soft if you bring these sizes. I will be bringing some black max to oxidize the silver with. It should be enough for the whole class. If someone would like to purchase this they can Google Rio Grande gems and findings. I also suggest to bring two pairs of flat nose pliers, one pair of round nose pliers and wire cutters. You do not need to spend a ton of money on these. I like to use a pair of flat nose pliers that gets small at the end. I also suggest bringing chain, what ever kind of chain you love. A small cable chain is great for earrings. Sometimes you can find and old necklace that is very delicate that you no longer use. You might want to mix up the chain that you put on one piece, I usually use sterling silver but you can mix copper, brass or vintage chain. It usually takes around 2 1/2 feet to make one necklace. 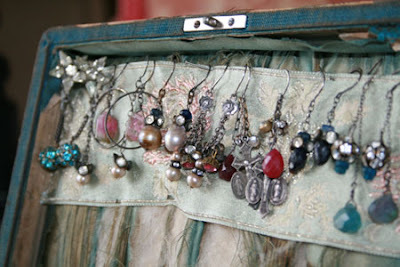 Vintage clasp are always fun to use and you can find them on vintage necklaces or maybe a bead store might carry them. 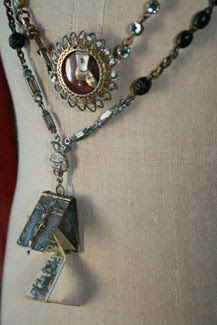 Bring old rosary necklaces, medals and watch fobs-- they are my favorite. 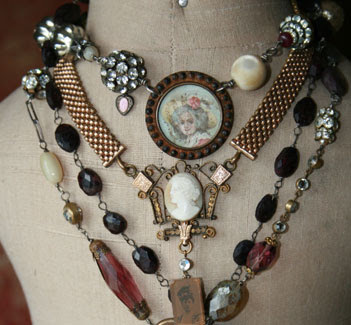 Don't forget the pearls, mother of pearl beads, gem stones, Victorian pieces and cool buttons. I use a lot of vintage cracker jack charms in pieces. I will also have some things for sale, but I want to stress to bring goodies that will make your piece special. 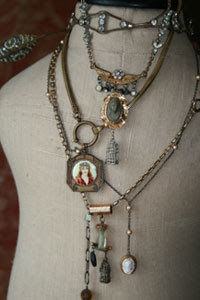 My favorite pieces are always made from my favorite things. It would be a good idea to bring earring hooks and watch swivels, lobster clasp or toggles. You may also want to bring some jump rings in different sizes. I will be bringing my soldering iron for demonstrating. 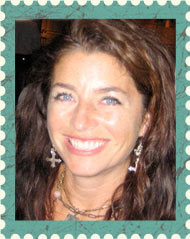 stay tuned as we will have a post from Pam and Anahata later this week. 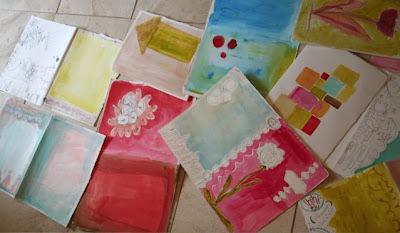 that we are cooking up some sunshine at The Art Nest for June. and the wild flowers will bloom just in time. At the Kimball Art Center, just a few steps down the road. 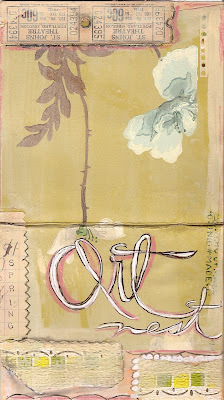 No need to decide what class to take, You will have one full day of class with each artist. Registration begins February 8th, 2008.